You'll be £14.99 closer to your next £10.00 credit when you purchase Invasion. What's this? I thoroughly recommend this thought provoking and well researched book. It cleverly documents the build up to a world changing event which thankfully never happened. Alternative histories can be fun, they can also be provoking, they may rest on thin foundations and be less than credible. This new book shows solid research, interesting observations and conclusions and has a high credibility factor. Often books of this type are an acquired taste. They offer a possible history which is different from that which has been established. However, there is much to learn and consider from this book which is recommended to anyone interested in the art of the possible and the reasons why it was not the actual outcome. 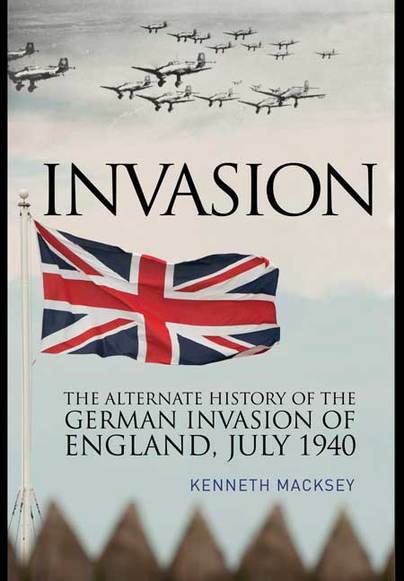 If you are looking for an alternative history book that gives you a believable version of if England could have been successfully invaded by the Germans in 1940, this book would be for you. It is believable and historically accurate as to the forces involved. You will be able to see how the Germans could get a beach head in England and make a successful invasion IF the Germans got air superiority. No air superiority. No invasion. Kenneth Macksey served in WWII under the command of Percy Hobart, later writing the authoritative biography of that leader. Amongst many other books, Macksey wrote two volumes of alternate history, one dealing with the (successful) invasion of England by Germany in 1940 (Operation Sea Lion); the other describing a NATO-Warsaw Pact clash in the late 1980s.